Extracted from RK Peacock, Evolution of Australian Light Horse Regiments 1841-1935, p. 16. This regiment may claim its origin to the 4th Australian Light Horse Regiment (New South Wales Lancers) in the Federal re-organisation of 1903. 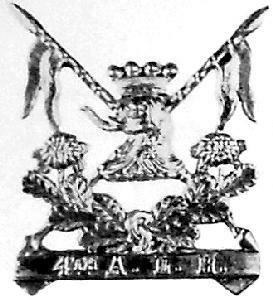 In 1907 the 4th becme the 4th ALH Regiment (Hunter River Lancers) and remained as such until 1912 when it became the 6th Light Horse Regiment Hunter River Lancers). This designation it carried unti 1918 when it became the 16th Light Horse Regiment Hunter River Lancers). The Right Honorable Charles Robert Earl of Carrington, PC, GCMG, 9 February 1886. Major William Charles Markwell, 1 July 1903. Second Lieutenant Arthur James Prentice, 1 January 1903. Major Robert George Alcorn, 1 July 1903. Lieutenant Joseph Arthur Wood, 1 January 1903. Lieutenant George Ireland, 1 July 1903. Second Lieutenant Thomas Gaites, 1 July 1903. Second Lieutenant Francis Joseph Berry, 1 July 1903. Captain Charles Edward Nicholson, 1 July 1903. Lieutenant William George Welch, 1 July 1903. Major Alister Stuart Bowman, 1 July 1903. Lieutenant Richard Halifax Dangar, 5 December 1901. Lieutenant Arthur James Prentice, 1 January 1904. Lieutenant Harold Bowker, 1 July 1903. Captain Joseph Arthur Wood, 1 January 1904. Second Lieutenant Henry Percy Burnage, 26 March 1904. Second Lieutenant Harold Henry Waddell, 1 April 1904. Second Lieutenant Douglas Ronald Waddell, 1 April 1904. Honorary Lieutenant Albert Edward Whittet, 10 September 1904. Second Lieutenant Reginald Saint Patrick Croudace, 20 March 1905. Second Lieutenant John Baldwin Meredith, Honorary Captain, Boer War Veteran, 11 April 1905. Second Lieutenant Edward Windeyer, 11 April 1905. Second Lieutenant Albert Simmons, 31 March 1904. Second Lieutenant John Thomas Smith, 20 December 1905. Lieutenant John Baldwin Meredith, Honorary Captain, Boer War Veteran, 11 April 1906. Lieutenant Albert Simmons, 29 November 1905. Lieutenant Harold Henry Waddell, 1 March 1906. Second Lieutenant Percy Faulkner, Boer War Veteran, 12 October 1905. Second Lieutenant Frederick Arthur Victor White, 20 December 1905. Lieutenant Francis Henry Thrift, 16 January 1906. Lieutenant McKenzie Samuel Kennedy, 1 March 1906. Lieutenant Cecil Horace Granville, 1 March 1906.